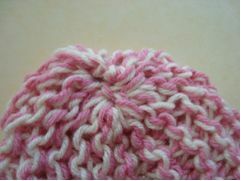 If you are new to knitting, give this easy newborn hat knitting pattern a try. This baby hat knitting pattern from M.E.H. 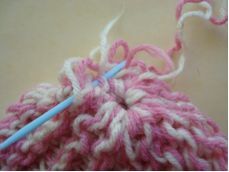 Designs shows you how to knit a baby hat and gather a simple knit square into a tube for the hat. 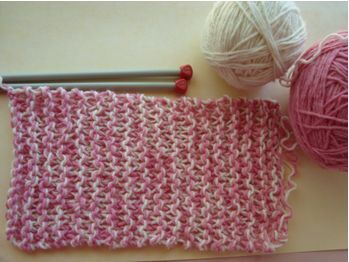 Two strands of yarn are knit together for a pretty look that is simple to achieve. This hat knitting pattern fits newborns to babies of 3 months, but can be adjusted for bigger sizes once you get the hang of the technique. 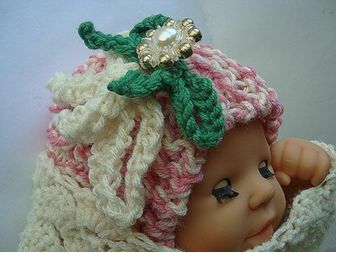 This baby hat knitting pattern can also be used to make a play hat for your child's baby doll. If you love knitted baby hat patterns like this, you're sure to love these other projects: Cuddly Bear Hat and Easy to Knit Sweet Baby Hat. 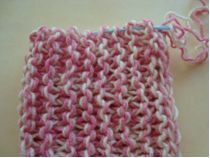 You can find this beginner knit pattern, along with several other easy knitting patterns, in our free eBook, Learn How to Knit for Beginners: 27 Easy Knitting Patterns. Gauge is not important in this design. 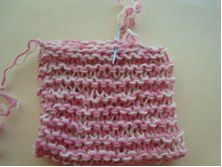 Working with 2 strands of yarn, as though they were one, Cast on 14 stitches. Knit across the row. 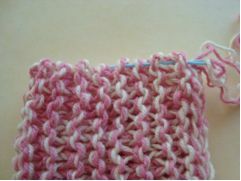 Knit across every row, until the rectangle measures 12 inches long. Cast off, leaving a long yarn end. Thread the yarn end into a darning needle. Fold the rectangle in half, and sew up the seam to form a tube. Secure at the corner with a few stitches, then weave the darning needle through one open end of the hat to form the top. Gather tightly, and take a few stitches to secure. Cast on 50 stitches, cast off. Weave the yarn ends into the finished chain. Pass through a few stitches of the hat, and tie into a bow. 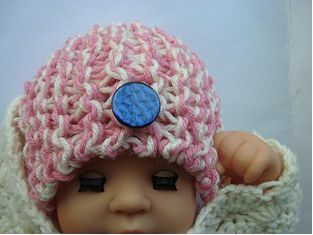 Embellish your hat with buttons, or the cord bows. I used this pattern but instead of gathering it at the top of the hat, I just sewed it straight across the top so that the hat was in the shape of a square. Then I made two pom-poms to put one on each point on the corners. It was ADORABLE. I have made this hat and it turned out great despite me being very new to knitting. I wanted to make some other baby stuff (I'm going to be an aunty soon) but can't find any other patterns as easy as this one. Is there anything out there? I cant wait to try this! My teachers' having a baby and its perfect! 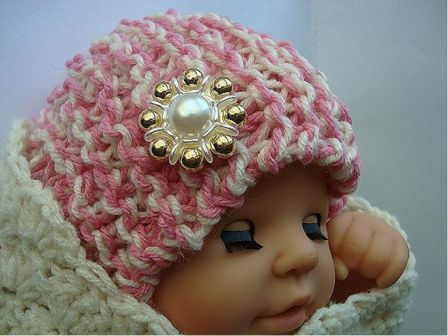 In reading the above comment, I can see how buttons would be a choking hazard for older children, but this hat is for a newborn, and I don't think newborns would be able to grasp a button, and put it in their mouths. However, people should always use common sense and logic in the garments they place on their children. I am concerned with the suggestion of using buttons as an embellishment. Babies put everything in their mouths! Make sure your embellishments are not a joking hazard.